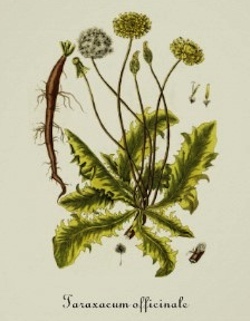 A few days back when I read a pal's post in Google+ in which he shared a pic of some freaky-arsed lovely flowers, it made me think about flowers in general, and then I thought about how dandelions are -- and always have been -- my faves. Oh, sure, roses are unquestionably awesome, with the doubleplus cool aspect of being closely associated with our Blessed Mother. Same deal with lilies, and their association with her Holy Husband, Joseph (yes, I know they're also associated with her). But even with all that, dandelions top 'em all for me. … Before we go any further, let's get one thing straight -- they're NOT weeds. First one to toss out that insipid whine gets their buttocks introduced to mah foot (as illustrated thusly). If that's your opinion, you're a joyless buzzkill who'd best move along right now. Dandelions are approachable -- no deathwish thorns will impale you should you decide to roll around in a field full of dandelions. And nobody hollers at and shoos away lil' kids from happily picking 'em. (Yeah, just try letting your toddler loose on Missus Fussypants' prizewinning Candelabra roses without a serious bloodletting.) You can pick great scads of dandelions right quick and friendly up your digs with 'em, even though they'll quickly wilt soon after. But, more than anything, dandelions are scrappy lil' survivors who don't need oodles of coddling (I'm lookin' at you, orchids) or special trellises, or drifts of precisely-mixed dirt-and-fertilizer, or a platoon of anxiously-hovering gardeners catering to their every need. No, dandelions are all like, "Dude! Check it out -- a sidewalk crack in the shade with heavy foot traffic! I can totally work with that!" And they do. And no matter how much folks wage war against their relentlessly cheerful presence, the dandelions always fight back. They take it on the chin (if they had chins), carry on, move on, make do, and give each other lil' high-fives from their homes in the cracked concrete of abandoned playgrounds. Speaking as a self-described slug, I am a fan of dandelions! Does this mean you have to answer both our questions???? Chris & Ambrose: Aww, c'mon, you guys! Now I have to respond to your questions? And post stuffs here?